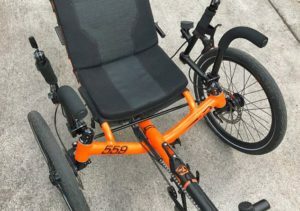 Catrike Assist Arms provide extra support while mounting and dismounting your Catrike recumbent trike. 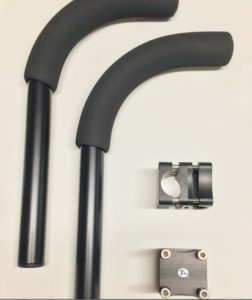 If you have a Catrike, and need a little help getting in and out, these are the Assist Arms for you! These arms provide the forms of support you need to safely and comfortably get on and off your trike. The smooth, curving arms provide multiple gripping positions and provide a nice sized area to rest your hands. The arms are centered over the front wheels. They extend forward so they are easy to reach when you are first getting on, and extend back towards you when you’re seated to help you start to get up. The front to back configuration also means there’s no twisting of hands or wrists required- your grip is always natural and comfortable. The custom low profile clamps provide optimal fit. Also available in Extra Long. 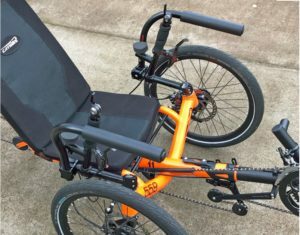 Catrike Assist Arms sold in a set of two. Easily mounts to your Catrike. Catrike Assist Arms shown in Extra Long.